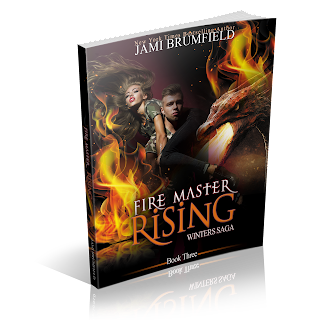 The highly anticipated release of the third book in the Winters Saga Series, Fire Master Rising is now available. Check out this entertaining excerpt and grab your copy available in Amazon Kindle, paperback edition or autographed paperback. The Winters have been to Hell and back, but through it all, they’ve always come back together, bonded stronger and unified to face the magical world they are now a part of. Power in numbers they say. Rebecca’s pack grows stronger everyday despite rising threats and old foes come calling. Miracle and Mystery are finding their places, Savannah is slowly acclimating to her new vampiric life, and Hunter has grown into a strong fire witch, gifted with the power of empathy. To make life perfect, all he needs is to escape his prison, save his sisters, and live a happy life with Natalia, but life rarely works out as planned, and Hunter’s life is about to take off on a dangerous roller coaster ride. Will he survive? Is happiness a hopeless dream? Find out in Fire Master Rising, book three of the Winters Saga. REBECCA HAD LEARNED MANY THINGS since becoming privy to the magic that existed in the world, hidden just below the surface of civilized society, lurking in the darkness, and only visible to those that had the connection. Her education increased even more since she merged into a pack alpha. One valuable lesson was the rules of traveling to alternate dimensions, and how tricky that travel really was. First you had to find the right portal, and make sure it went to the right world, and then you had to make sure it didn’t drop you off in an inconvenient location, like the middle of a public place or the bottom of the ocean. Magic only helped a being get through the portal, it didn’t help direct where they went, and it didn’t conceal their arrival or departure. Dimensional travel was not for the novice supernatural. One needed to be prepared for just about anything. Kia, the dragon shifter assigned to help Rebecca take down the drug trafficking of Black Death in her world, suggested the portal they were using today as an alternative to the one she’d been through before. The portal they were forced to use today delivered them to a bathroom stall in a dive bar. It was troublesome. At most, only one person could travel through at a time, but it was fairly safe as long as no one entered the bathroom while they were transporting. She would’ve used the one they brought her through when Becky and her team first kidnapped her, but it was too much of a risk. They had no idea who was controlling it at the moment. It could be either the wolves or the dragons…or something worse. The biggest concern was that Becky was oddly out of communication. That knowledge didn’t help matters, and made this journey far more dangerous. If they weren’t on a rescue mission for her overzealous brother they would not be taking the chance at all. Not until they could contact her double here. But Hunter left them no choice. That being the case, here they were. One by one, piling up in the small, smelly, grimy bathroom that looked like it had been at least a month since it had seen a good cleaning. Her large group was almost complete; Kia, Lucky, Miracle, Mystery, Gabriel, Savannah, Natalia, Sundae, Georgie, Jackson, and now they were waiting on Maverick, who had insisted on coming despite how little Rebecca did to make him feel welcome. She knew she should be thankful her father was alive after all these years, but there wasn’t a single atom in her body that cared for the man who left them without parents, and made her blame herself for their deaths. She heard a splash, and a string of curse words announcing his arrival. She fought off the urge to laugh, which was far easier than she expected as Savannah narrowed her disapproving eyes at her sister. When he exited the stall with a wet pant leg everyone except Rebecca had the good sense to look away. Rebecca tossed her blonde curls behind her slender shoulders and chuckled at the mess he was. “I’m sorry. I should’ve told you we were arriving in a toilet.” Her sapphire eyes glared at him making it clear to everyone, he may be here with them, but she had no desire to forgive him for his hand in their mother’s death or his abandonment of them afterwards. The alpha wolf in Rebecca’s mind, who preferred to be called Siren, snarled making it clear she wasn’t happy about any of this, especially about working with vampires. Her instant hatred of the vampires was more biological and instinctual than anything else. Vampires and werewolves were genetically designed enemies; perfectly matched in every way, complete with a primal need to destroy each other whenever the chance arose. Before Rebecca and Celestia - Savannah’s sire, signed the truce to enter into peace talks, the idea of working together would have been laughable. Now, it was expected, enforced by the Authority, Convent of Souls, and Protectors. But none of that dictated she couldn’t be passive aggressive in making her father pay for all the torment he put them through, and for the fact that he hid Mira and Mysti from them. “Kia, please lead the way.” Rebecca swept her arm out, and turned the leadership over to the spunky, petite, brunette dragon shifter. She was an example of ‘looks can be deceiving’ just like Sundae, one of her new pack members. Sundae was once a dream assassin, and now she was a werewolf after Rebecca accidentally infected her with the virus. It was the same night Georgie joined the pack, only in Sundae’s case, making her a wolf was an accident. Georgie took that choice from Rebecca. Rebecca didn’t want to take the chance on the military veteran who was suffering post-traumatic stress after being cursed by a group of supernatural beings in the African desert. She was mentally unstable. But the beast master, and her wolf, had different ideas. It only took a scratch from her wolf claws, and the girl was forced to face her biggest battle, the one for her life. Both Sundae and Georgie were on the verge of death before the infection receded, and they were changed into wolves. It was odd since Rebecca’s reaction to being infected was a nasty flu that kept her in bed for a couple of days. She suspected it had something to do with the merging of her magic and her wolf, but had no way to prove it. She wasn’t in the market to create more wolves at the moment, despite the growing need. The dive bar lived up to its name. ‘End of the Road’. Rebecca couldn’t help but empathize with those lost souls drinking, and snorting their pain away with alcohol and drugs. She was on the same fast track before she discovered the werewolf community. Her music was the only thing that seemed to keep her sane back then, her music and her siblings. The death of her parents had left her with a terrible case of survivor’s guilt. It was because of her weakness that they were killed, or at least, that was what she was left to believe for the last ten years. It was only recently that she discovered her mother’s death had very little to do with her, and everything to do with the world of magic and their families. None of that was important now. Now, they needed to find their brother, and bring him home. The smell of human pain, cyborg mechanics, and shifter magic mixed with desperation, assaulted her senses. The continuing war in this universe was a devastating example of what greed and power wrought. Gabriel slipped his fingers into Rebecca’s hand. His very presence put her, and her wolf at ease. She offered a shaky smile in his direction as she watched her pack of misfits keep their heads low while they left the bar. Kia led them down back streets, doing her best to keep them out of sight. They all knew they didn’t belong here, and it was obvious how much their group stood out against the heartbreaking inhabitants of this world. Humans were scattered on the streets living in boxes, and scrounging through the trash to find food. The people were dirty, their clothes shredded and worn. Her team looked healthy by comparison. Their looks weren’t the only indication they didn’t belong, they smelled different too. People from here smelled metallic and sulfuric, and those from her Earth were more organic. It only took about forty-five minutes before they made it to their destination. Kia’s directions got them there safely, and only required them to duck into random alleys a few times to avoid the local population. How the dark-haired, petite, dragon shifter managed to keep them from attracting attention made Rebecca respect her even more than she already did. Kia had become a valuable member of her pack, even if she was on loan from Becky. The abandoned warehouse that served as the dragon shifters’ headquarters was painfully familiar to Rebecca. It was where they took her when they kidnapped her the first time. The place was still a run down, grimy mess. She supposed that was to keep the appearance up that it was uninhabited. But she knew the truth. There were many dangerous shifters that called this place home. As Rebecca and her team entered the warehouse, she could feel the uncomfortable push that occurred when she was in close proximity to Becky - her alternate dimension double, and the leader of the dragon shifters on this Earth. She looked around, and saw a furious Becky approach them with purposeful strides, her trusty gun drawn and hanging at her side, finger close to the trigger. Rebecca wasn’t worried for herself, but she knew Becky was unstable, and her concern was for her pack and family. She stepped in front of her pack, comfortable in the knowledge that she was protecting them. Rebecca didn’t think she’d ever get used to the angry dragon wearing her face. She wasn’t Savvy, she wasn’t her sister. Unfortunately, she was her, only raised under different circumstances. In a strange way, she reminded Rebecca how miserably insane she would’ve become if her life had been altered. It made her grateful for the messed up existence she did have. “What the hell are you doing here?” Becky asked, only focused on Rebecca. Her alternate was a dead ringer for her, minus the chocolate-brown hair, and the new scar on her cheek. In a way, the scar made her look more treacherous, if that was possible. Rebecca knew this version of her was lethal. It only took one look in Becky’s violet eyes to feel like she was being assessed by a predator. “Hunter? How difficult is it to keep your family safe?” Becky roared. “At least I have a family to take care of.” Rebecca regretted the words the moment she spoke them, but tension always arose when two alphas faced off. Perhaps Becky had good cause to be bitter about the whole ordeal. She’d lost her entire family in the car accident, but Rebecca hadn’t. Then, Becky lost her grandmother a year or two later. In an odd sort of way, holding Rebecca accountable for her family’s safety made freakish sense. Becky seemed to grow in size, if that was possible. She looked like she was fighting off a shift. “You would do well to remember I eat wolves like you for dinner.” Smoke wafted out of her nostrils, and Rebecca felt the power of the dragon even behind her shield. She was thankful her pack was behind her, shielded by the same invisible barrier that protected her. At least until Savannah stepped forward to examine Becky closer. “Dear gods, Becca. She looks more like you than I do.” Savannah and Rebecca were identical twins, with only a few differences between them. Before Rebecca became a werewolf, and Savvy a vampire, it was almost impossible to tell them apart. Now, however, their looks were changing a little, morphing them both into different creatures, and telling them apart was far easier. Rebecca didn’t know why it was that way, but suspected it was because they were new creatures, and somehow, their DNA was altered. She wasn’t entirely sure, but her human body never felt quite the same after her first wolf transformation, and she suspected that when Savannah woke from the dead she was altered as well. Becky’s furious violet eyes turned toward Savannah. Sadness mixed with loneliness, and happiness danced in their midst. It was an eerily odd combination. But the sight of Savannah managed to calm the maddened shifter down enough that the smoke was no longer being emitted from her nostrils. “Savannah?” Becky’s voice cracked a little. Becky wrapped her arms around Savannah and held her close. It took Savannah a moment to reciprocate the embrace, but she did, more out of obligation than desire, Rebecca suspected. Even so, a tinge of jealousy seeped into Rebecca’s mind. Savvy and Becky weren’t genetic enemies. They were just two supernaturals with a family in common. Rebecca pushed back the inappropriate feelings and refocused on the matter at hand. Becky and Savannah could have that connection that she gave up without a second thought. The connection that was severed the night she transformed into a werewolf for the first time. A tiny part of her was thankful that they weren’t connected with the twin sense anymore because Savvy didn’t have to feel her pain every time she morphed into a wolf, but deep down losing it hurt her far more. Savannah was her sister, through thick and thin, love and hate. Their mother promised they would always have each other. For eighteen years, all they had was each other, Hunter, and grandmother. They were just starting to get used to the idea of Maverick, Mysti, and Mira. They didn’t need another sister, especially one she couldn’t even get in close proximity to without producing a protection barrier. “So can you help us or not?” Rebecca asked, finding it difficult to keep the annoyance out of her voice. “I’ll continue our work on eliminating the drug ring on my side once I free Hunter.” Rebecca’s hands fisted at her side. She had very little patience for her double. The shaking of her limbs did little to hide the urge to punch the she-dragon. The desire to hurt her double rolled through her like waves holding on by a very weak thread. “I may be a little crazy, but I’m far from stupid. I can’t hurt you, but there is nothing stopping me from hurting your friends or family if you don’t make quick work of exterminating my rodent problem.” Her voice made it undeniably clear she’d hurt those close to Rebecca if necessary. “And when I’m not useful anymore?” The obvious question slipped from her lips. She was being pushed to her brink, and the animal was coming close to the surface, weakening her inhibitors, primal instincts taking the driver’s seat. ‘The kind of person that has seen too much death and destruction,’ Siren answered the question in Rebecca’s mind. ‘You don’t need to defend her.’ The snarl from Rebecca in her mind was unnecessary, but she was irked beyond her normal tolerance at this point. Gabriel stepped forward, using the advantage of surprise as he punched Becky squarely in the jaw. “I don’t take kindly to people threatening my mate or our pack.” The blow was hard enough to send Becky flying backward. Lucky jumped to his side, always ready for battle. It was one of those moments when Rebecca wished she wasn’t protected behind an air barrier. She wanted to be the one that dealt the punch. ‘I’ll always have your back, my love.’ Gabriel grinned as he spoke in her mind using the mating connection. Becky jumped up, and her body began morphing into a beautiful but deadly dragon. Iridescent purple wings sprouted from her back. Her skin started turning into lavender scales, and she fell to all fours. Smoke wafted from her nose as her head morphed into that of a dragon. The process took very little time. Gabe barely morphed into the wolf before the dragon used her large talon to send him flying as easily as someone batting away an irritating gnat. The hair on Rebecca’s face grew, her eyes turned violet, her teeth elongated, and her claws came out. There was very little she could do with the air shield in front of her, but that didn’t stop her from trying. Her wolf was readying for battle, and if any of Becky’s pack came near, they’d suffer the pain she wanted to inflict on her double. Lucky drew two swords from his back holster. Sundae, Georgie, and Savannah fell in line with Lucky, ready to defend. Gabriel shook off the pain, and circled behind the dragon, still in wolf form. The mating bond told her he was hurt more than he let on. ‘Back down, Gabe.’ Rebecca warned. ‘Idiot! I think sometimes you’re going to be the death of me,’ Rebecca sighed heavily. Kia morphed into an emerald green dragon, and stepped in front of Lucky and the rest of the pack attempting to protect them. Both dragons faced off and circled. Right before Kia was ready to strike, Georgie stepped forward. “I command you, dragon, to stop. All the animals in the room froze including Georgie who let out a frustrated breath. She really had to work on that. “At this point, Becky, we have the upper hand. Are you willing to concede?” Lucky asked, swords swishing through the air as he was one of the few who wasn’t frozen. The dragon couldn’t move, but the smoke leaving her nostrils, and the concession in her violet eyes was enough to convince them. “I release you,” Georgie spoke with difficulty. The animals were free to move again, all morphing back into their human forms. Gabriel and Lucky stood in front of Georgie, and pushed her back behind the protective shield that was in front of Rebecca. Rebecca shook her head. “No, I really don’t.” She turned to Georgie and Sundae. “You two take Savannah and … Maverick back home.” They nodded. “I don’t want to go.” Savannah practically stomped her foot. She was getting overly temperamental lately, and Rebecca hoped it was just a phase she was going through because her temper tantrums were getting exhausting. “You will be safer at home,” Rebecca tried again. “I’m not going either,” Maverick chimed in. Becky’s eyes narrowed on Maverick. It appeared she didn’t like the man that was their father either. Maybe someday Rebecca would ask her about that, but not today. Today, she didn’t care. Today was about saving Hunter. “He’s my son.” Savannah and Maverick spoke at the same time. Rebecca shrugged her shoulders. “Suit yourselves.” On the outside, she looked okay, but on the inside she was worried about Savvy’s safety, and deep, deep, way deep down, Maverick’s too. ‘You’re pathetic sometimes,’ Siren whispered angrily. ‘And other times, I am outstanding.’ She reminded her wolf of the battle with Devon a couple of weeks ago. ‘So deal with it.’ That battle did more than solidify her leadership as the pack alpha. It also earned a little respect from Siren, who shared her mind. Becky let out an angry scream. “Fine! Take Jaden and Kia, and find your brother.” She began walking away, and the protective barrier blocking Rebecca disappeared. She turned back, eyes zooming in on Becca. “If you find my people, please bring them back to me… alive if at all possible.” She spun around from them, and started walking away again. “And please, find time to keep your promise.” Her voice echoed through the empty warehouse.